Easiway PlastiSolv 842 Press Wash - RC Screen Shop & Supply Co.
SKU: EWS-PS842. Categories: Chemicals, Easiway. 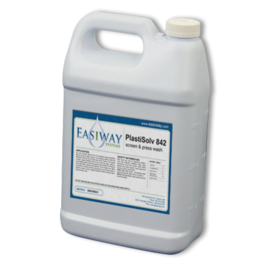 Tags: easiway, plastisolv, press wash.
PlastiSolv 842 Press Wash cuts ink fast and quickly dries for on press color changes, screen opening or saved screens.